Rodfather's was created by Rod Wallenbeck after years of searching for the perfect sauce for his family. Disappointed with what was available in his local supermarkets, Rod took it upon himself to develop an alternative. The result is his sweet and smooth Rodfather's Premium. Rod's sauce makes a great impression right away with its packaging. Glass flask bottles always present beautifully. The thin, sticky sauce is dark and smooth in the bottle and pours quickly. Most sauces are characterized either on a base ingredient: vinegar, tomato, mustard... or a particular flavor element: sweet, spicy, tangy, smokey... Rodfather's is unusual in that it's primary ingredient is brown sugar. There are both tomato and vinegar elements in the sauce, but it's clearly unique in composition. Without question, the sauce can be categorized as "sweet". Out of the bottle, the sauce smells sweet and very smokey. There is definitely more than just a hint of liquid smoke. Rod describes his sauce as "velvety" and I think that's a perfect description for both the flavor and texture. The sweetness is rich and deep. It's accented by Worcestershire sauce and vinegar giving is bit of tang. Whiskey is a very minor ingredient in the sauce, but it makes an impact on the flavor. Not being a drinker myself, I'm always keenly aware each time whiskey is included in a sauce. I don't find it off putting. It's simply something that stands out. 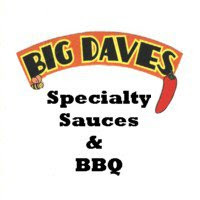 I've used the sauce on pulled pork, poultry and ribs. The thin sauce pours well over shredded pork and works well as a dip. I served the sauce at a church function and got a thumbs up from nearly everyone. Kids especially seemed to enjoy it (don't worry, there's no actual alcohol content). Though relatively thin, Rodfather's isn't too thin to use as a glaze on ribs. It's sticky and clings to anything your pour or brush it on. There is definitely an audience for a sauce like Rodfather's. Anyone that enjoys Memphis style sauces, for example, should give Rodfather's a shot. It doesn't balance quite as well as I would like, but there are a lot great elements working in the sauce. To purchase Rodfather's, check out their website. 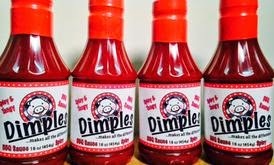 Or, if you happen to be in the Syracuse, NY area, several local retailers carry the sauce. Did you know that pulled pork doesn't actually come from the pig in bite size pieces? Believe it or not, it actually has to be pulled. Who knew? Pulled pork generally comes from large shoulder roast. These roasts often weight 8-10 lbs and have to be meticulously "pulled", separating meat from fat and bone by hand. If you smoke shoulders with any regularity, you know that this can be a messy, time consuming, and even painful job. I've smoked countless pork shoulders over the last 10 years. Until recently, every one of them has been pulled by hand. I've burned my fingers more times than I can count. Thankfully, that won't be the case anymore. 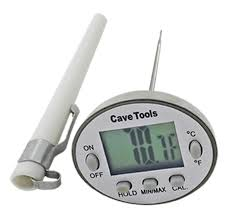 Cave Tools, makers of a wide array of BBQ tools and accessories, has a product that makes the entire process quicker, cleaner, safer and easier. Cave Tools Meat Claws are a highly specialized tool made specifically for shredding smokin' hot pork. Looking like an accessory to an X Men Halloween costume, the Meat Claws are cast of hard plastic and have six relatively sharp prongs? blades? They're just big enough for my hands, but not too big for little hands. The tiny hands doing the shredding in the image below belong to my four year old daughter. I recently smoked a shoulder overnight and pulled it from the smoker early in the morning. Since I had the claws, I didn't need to wait for the meat to cool. Cave Tools' Meat Claws made really quick work of the 8 pound roast. It went from complete roast to what you see above in the span of 60 seconds. It couldn't have been quicker or easier. It was easy enough that I let my little girl finish the job. The claws made it very easy to separate the fat leaving just the tasty, smokey meat behind. Conservatively, I'd say it cut the shredding time by 60-80%. Additionally, my hands weren't burnt or covered in grease when I finished. These meat claws are admittedly limited in function. Aside from shredding pork, there isn't anything else that I can realistically see myself using them for. That being said, they're remarkably effective for their single purpose. Even if you only make pulled pork once or twice each year, they're probably worth the nominal investment. Cave Tools Meat Claws can be purchased directly from their website or via Amazon.com. The food scene is full of artists. Chefs and photographers often get top billing, but they can be found in every facet of the industry. Though maybe not the first artisans to come to mind, woodworkers have carved out their own niche with the evolution of artfully crafted butcher blocks. Brooklyn artist, Nils Wessell, is at the forefront of this movement with his company, Brooklyn Butcher Blocks. Nils is a formally trained (Bard College) studio artist and sculptor who literally bounced from coast to coast in pursuit of an art career. He eventually settled in Brooklyn and apprenticed at Cut Brooklyn, a high end knife maker. While there, he focused his art on woodworking making components for knives and experimenting with various other projects in his spare time. Seeing a demand for well crafted end grain butcher blocks, Nils put his skills to work and Brooklyn Butcher Blocks was born. While still a relatively small operation, BBB now supplies restaurants, chefs and home cooks all over the country and internationally. Major publications like The New York Times, Esquire, GQ and Bon Appetit have taken notice. I stumbled upon BBB while doing a web search for end grain boards. Nils' signature walnut brick work board caught my eye immediately. This beautifully crafted board is designed to reflect the plentiful historic brick buildings that comprise most of Brooklyn's landscape. Nils was kind enough to send both the brick work board and another signature product, a cherry meat board. Nils admitted that these were his favorite items in BBB's continually expanding product catalog. Each is very unique and represents a conscious commitment to both artful craftsmanship and functionality. My particular brickwork board is a stunning dark walnut and measures 12 x 18 x 2. Various size and wood options are available. The beauty of working with BBB is that Nils can create pretty much anything you can dream up. For me, this size is perfect. It's great for our limited counter space, but still big enough for displaying larger cuts of meat (Ribs, Brisket). The weight is also much more manageable than my old maple end grain board of the same size. Their are no legs on the board so it lays flat on the counter. On one hand, this is great because it provides double the surface area, just flip and re-use. On the other hand, large boards generally sit stationary on counter tops for long periods of time. Therefore, it's important to keep the moisture under and around the board in check. One thing I've noticed about this board is that the scratches left behind by the knife's blade are slightly more noticeable than on my maple board. I've been using the board regularly for a couple of weeks. The cut marks are slight, but noticeable if you look closely. Thankfully, as I previously mentioned, the board is reversible so any wear and tear can be kept to one side. Having only owned one end grain board previously, I'm not sure whether the increased wear visibility can be attributed to the actual wood type or simply the darker color. I wasn't entirely sure what to make of the meat board when it arrived. It's such a stark contrast to the polished, elegant brick work board. My cherry meat board is rustic and roughly hand sanded. Meat serving boards are generally 9.5 x 12 x 2 and produced from reclaimed wood (your choice). The board is intended as an individual serving plate for carnal cuts like steaks and chops. Nils sells these, predominantly in cherry, to upscale steakhouses and discerning chefs. He also mentioned that it's his favorite way of eating and displaying a steak. I have to agree with him. I grilled up a gorgeous T-Bone immediately after receiving the board. I'm not sure if the board made the steak look great or the steak made the board look great. Either way, it was exceptional presentation. I've reviewed dozens of cool tools and gadgets from the BBQ world. Some have been beautiful and others functional. Nothing has come close to blending form and function the way BBB's boards have. 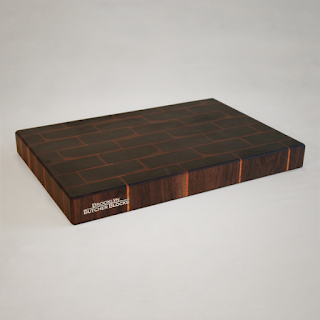 Brickwork and meat serving boards are exceptional, but they're only a small portion of BBB's product line. Nils churns out everything from tables and chairs to countertops and beer mugs. He even makes a custom board designed to hold your favorite tablet, iBlock. Admittedly, the beautifully crafted products from BBB are luxury items. However, for serious cooks that are concerned with presentation, these kinds of boards are essential. 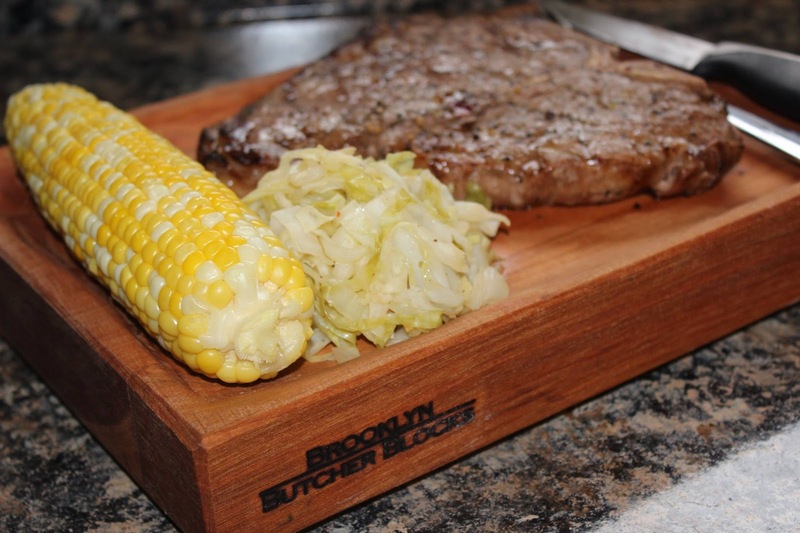 You won't find any better than Brooklyn Butcher Blocks. Check out their entire product line at www.brooklynbutcherblocks.com. They can generally turn around standard orders in just a few days. If you don't see exactly what you're looking for, drop Nils a line via email or social media. As I said before, custom projects are not a problem. In fact, I suspect Nils would enjoy the challenge.